Extend the life of color treated hair with AVEDA color conserve SHAMPOO 250ml, a gentle shampoo for coloured hair. The gentle formula leaves hair silky soft, shiny and clean, without fading colour. Colour is left vibrant and hair protected from the damaging effects of the sun, water and other environmental stresses. A plant-infused shampoo with an aroma of Lavender and Ylang Ylang. Active Ingredients: English Lavender, Ylang Ylang. Hair Type: All Hair Types, Colour-Treated Hair. Delivery is FREE on orders over £30.00. 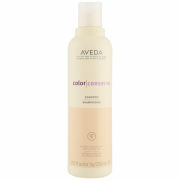 AVEDA color conserve SHAMPOO 250ml was found on 2 websites and was price compared using EAN: 0018084807132. The cheapest AVEDA color conserve SHAMPOO 250ml is shown as the main item, prices range from £20.00 to £17.64, excluding delivery. Price comparison based on price and delivery charges, with any valid discount codes being applied, is shown in the table above. Prices and information correct at the time of publication.